On National Poetry Day 2017, we are delighted that Jim Carruth, Glasgow’s Poet Laureate, has composed a poem for Govanhill Baths. all that rubble from the ruined tower. Some above would love to see you drown. surrounded by a bobbing cacophony of words. Come find your tongue – join the chorus. 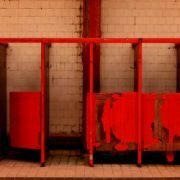 After 17 years of determined campaigning, the people of Govanhill are about the build the next era in the history of their beloved Edwardian bathhouse and pools. Because of the solidarity and unyielding commitment of local people the project has almost reached the £6.4M target needed for the new Wellbeing Centre. There is just £300k left to raise- if we pool together we can reach our goal! 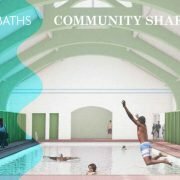 We want you to get involved by investing in the Community Shares programme and returning Govanhill Baths to cooperative community ownership. As a shareholder you will have a say and vote in the operation and running of the new Wellbeing Centre. Community Shares cannot be sold but can be withdrawn, along with 3% interest earned on your investment. Salary: £8.45 an hour, plus pension. Conditions according to GBCT standard contract. •	Understand the Trust’s policies in relation to all of the Trust’s work. •	Ensure the delivery of a safe, healthy, and clean working environment that is conducive to the wellbeing of Trust employees, visitors and volunteers. •	The ability to work on own initiative. Govanhill Baths Community Trust are delighted to confirm that Tom Urie will be joining us at this year’s Poetry Splash to provide the music on the night. 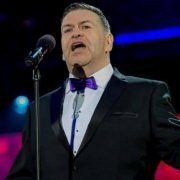 Fresh from his incredible performance of Nessun Dorma at Last Night of the Proms, Tom will join poets Jim Ferguson, Victoria McNulty, Leyla Josephine and Calum Rodger for the sixth annual ‘splash’. Tom took part in the second splash in 2013 with Liz Lochhead, Rab Wilson and Harry Giles.